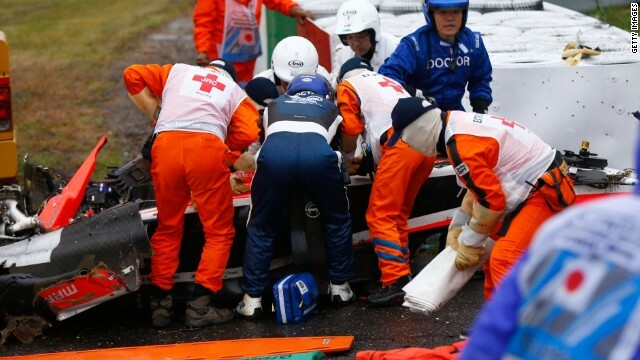 The world of Formula One has been shocked after popular French racer Jules Bianchi suffered a serious head injury during a crash at the Japanese Grand Prix on October 5. 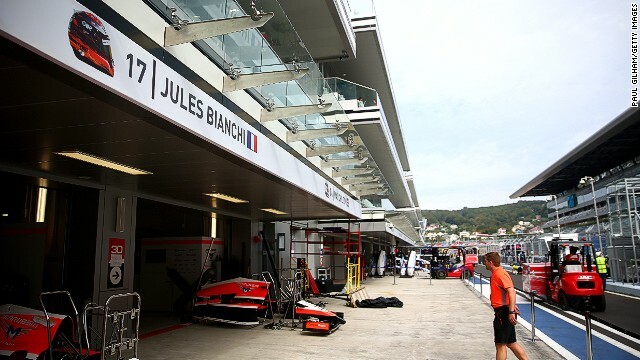 Bianchi, who is in his second season with the Marussia team, received urgent medical treatment after crashing when rain fell towards the end of the race at the demanding Suzuka circuit. 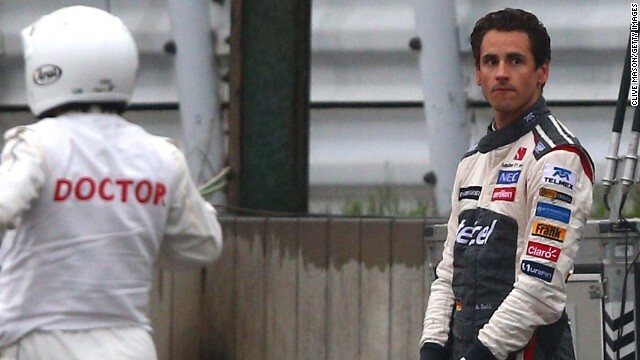 A visibly distressed Adrian Sutil witnessed the crash. Bianchi collided with a recovery vehicle that was attempting to move the German's Sauber. Marussia chose not to run another driver in Bianchi's car at the next race in Russia out of respect for the Frenchman who remains critical but stable in a Japanese hospital. 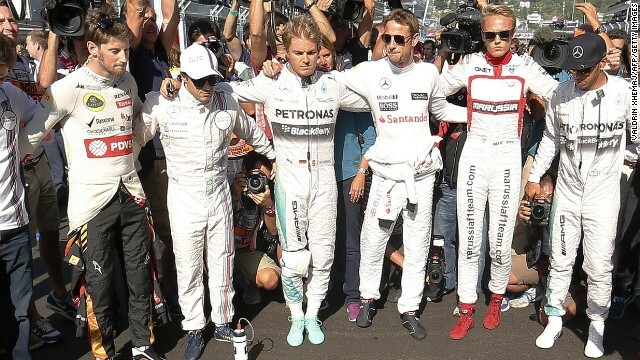 There were subdued scenes in Sochi as the F1 drivers hold a minute's silence before the race in respect for the stricken Bianchi. 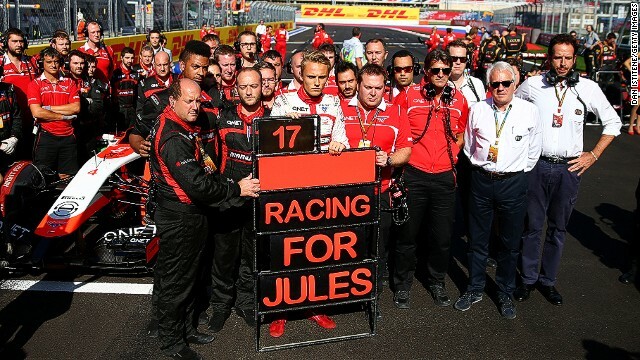 Marussia staged its own emotional tribute on the grid with sole driver Max Chilton holding a pit board which reads "Racing for Jules." 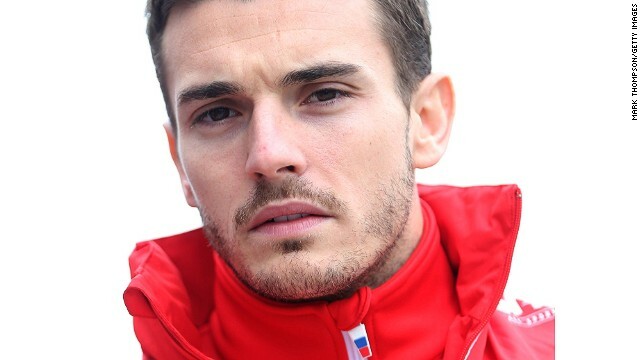 Marussia adds at no point "did the team urge Jules to drive faster"
(CNN) -- As Formula One racer Jules Bianchi continues to fight for his life in a Japanese hospital, his Marussia team says it has been angered by "a number of media reports" into the cause of the accident. The French driver spun off in rainy conditions in the closing laps of the Japanese Grand Prix and collided head-on with a recovery vehicle. 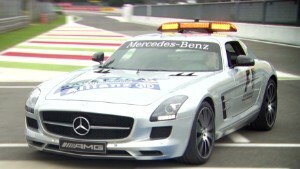 The vehicle was removing Adrian Sutil's Sauber which had left the track on the preceding lap, prompting double yellow flags to be waved to warn drivers to slow down and be prepared to stop. Various reports suggested that Bianchi did not slow down and that the team had actively encouraged him not to do so. "The Marussia F1 Team is shocked and angered by these allegations," said the statement. 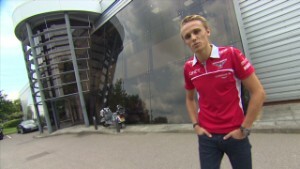 "At a time when its driver is critically ill in hospital, and the team has made clear that its highest priority is consideration for Jules and his family, it is distressed to have to respond to deeply upsetting rumors and inaccuracies in respect of the circumstances of Jules' accident. "However, given that these allegations are entirely false, the team has no alternative but to address these. "Regarding point 2, an audio copy of the full radio transmission between Jules and the team, and a written transcript, were provided to the FIA. "It is quite clear from the transmission and the transcript that at no point during the period leading up to Jules' accident did the team urge Jules to drive faster or make any comments suggesting that he should do so." The FIA is investigating the accident and is considering implementing a system which will automatically slow down the cars following a crash. Charlie Whiting, the FIA's race director and safety delegate, gave a briefing to media in Sochi in which he outlined these plans. He also indicated that Bianchi had slowed down prior to his accident. Bianchi's family issued an update on the 25-year-old's condition Tuesday, nine days after his accident at Suzuka. "As a consequence of the accident at Suzuka a number of medical challenges have needed to be overcome," the statement issued by Marussia said. "The situation remains challenging due to the diffuse axonal traumatic brain injury Jules has sustained. "Jules remains in a critical but stable condition in the Intensive Care Unit of Mie General Medical Center in Yokkaichi. "The Bianchi family continue to be comforted by the thoughts and prayers of Jules' man fans and the motor sport community." There was a moving show of support for Bianchi before the drivers resumed racing for the first time since the accident at the Russian Grand Prix. The Frenchman's 21 fellow Formula One racers gathered together at the front of the grid in Sochi for a minute's silence. Earlier, Bianchi's Marussia team made its own tribute with its sole driver in the Russian race, Max Chilton, holding a pit board which read, "Racing for Jules." Lewis Hamilton, who won the race for Mercedes to extend his lead in the drivers' championship, later dedicated his win to Bianchi.